A back-link is a link which directs visitors towards your site. Back links are also referred as inbound links. These are especially important for SEO, as search engines such as Google will give more credit to those sites with a good number of quality back links. So they will then consider these sites more relevant than others in the results pages of a search query. 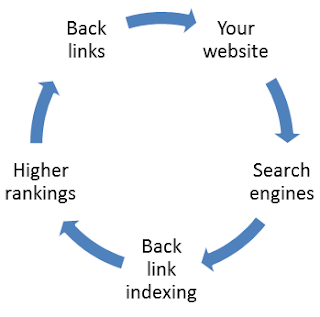 Search engines uses back links indexer to index all the back links. I posted the main features of search engines in my post "Search Engine Optimization Starter Basic Guide". Increasing back-links shows an increase in the value of the site. So, the number of back links that your site has is an indication of how popular or important your site is than your competitors. Although it is easy to manipulate the internal links on a web page using internal linking in each posts for seo but to influence ranking with external back links from another site is very hard. This is why the importance of back linking are so high in a search engine’s algorithm. 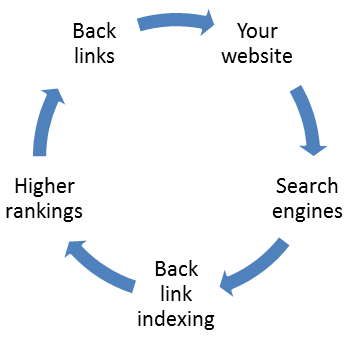 The process of back linking is an aspect of off page seo. Reciprocal Linking - A mutual give and take policy where you add a back link to another similar site that provides the same service or product and they in turn add a link of your site on theirs. Site Submissions - Submit links of your site to directories through free submissions and paid submissions. Most of the directories also use reciprocal Linking to give you a back link. Articles - Submission of well researched articles to sites such as EzineArticles.com or SearchWarp.com to get back links. Guest posting- Writing good posts related to the target site which consist of between 350 to 500 words.In this you also get an opportunity of a resource box where you can include a short biography regarding you and your site. Volunteer to be the subject of a case study. Websites are always looking for customers willing to be the subject of a case study. Volunteer for such websites and get a back link after it's published. Just join these forums and insert your home page link in the website section in your profile. You do not need to post in the forums. Sign Up to these websites To Put Your Website link In your Profile. Replace http://2.bp.blogspot.com/-Yg1R-qFMSLA/UJ0gRtG5FTI/AAAAAAAAAdA/Ijw8EBtulEQ/s1600/logo+copy+2.png to the URL of your logo. Replace http://www.shipmethis.com to your home page. Replace the http://2.bp.blogspot.com/-Yg1R-qFMSLA/UJ0gRtG5FTI/AAAAAAAAAdA/Ijw8EBtulEQ/s1600/logo+copy+2.png to your desired URL of the badge. This image is what appears in the other site. Change Blogger Widgets into your desired titles. Hope this post gave you an understanding of what back links and the importance of them in search engine algorithm. Subscribe us to get related posts that makes your traffic go high as a rocket.